Last weekend, the cinemas of America were bursting with several fine films—Captain America and Harry Potter in the multiplexes, The Guard, The Future, Tabloid, Project Nim at the art houses—yet the big hit was The Smurfs, a CGI-enhanced big-screen version of the intolerable, one-joke cartoon series from the 1980s. 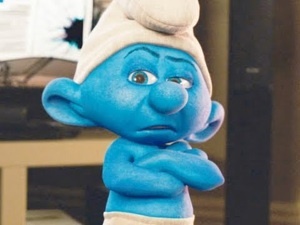 The film has been a punch line for months, but when the receipts were tallied up, The Smurfs came within a hair of beating the weekend’s top grosser, Cowboys & Aliens, co-starring no less than James Bond and Han Solo. Suddenly, the previous big question surrounding The Smurfs (“How the hell did that get made?”) has been replaced by a bigger one (“How the hell did that make so much money?”) and sadly, both questions have the same answer: the 1980s nostalgia factor. The movie poster is a tricky form, a very specific merging of art and commerce that must sell a product but hopefully also convey the essence of the picture in question. Occasionally, the marketers and artists responsible for them can run afoul—either in the court of public opinion, or in the boardrooms of the MPAA, who not only rate films but control their advertising. After the jump, we’ll take a look at ten movie posters that stirred up some controversy—sometimes intentionally, sometimes not. Open Thread: What Movies Make You Cry? So here’s an intriguing story that’s been working its way through the blogosphere: a pair of UC Berkley researchers have determined that the final scene of Franco Zeffirelli’s The Champ, in which Jon Voight’s washed-up boxer dies in front of his son (played by nine-year-old Ricky Schroeder), is the saddest movie scene of all time—that is, it has been scientifically proven to be the film clip most likely to make people cry. Don’t argue, it’s science. The details of the research are compelling, and its conclusions were certainly not arrived at hastily. And yet… there’s just something about this story that rubs your author the wrong way. The “cry-ability” of a movie doesn’t seem all that measurable—like laughter or fear, crying at a movie seems such a singularly personal and subjective experience that it hardly seems quantifiable. Which begs the question: what makes you cry at the movies? Tomorrow marks the release of The Rise of the Planet of the Apes, the latest installment of the surprisingly robust franchise that began way back in 1968 and has withstood five original sequels, a television series, a cartoon series, comic books, and a Terrible Tim Burton Remake™. (Between Apes, Charlie and the Chocolate Factory, and Alice in Wonderland, the Terrible Tim Burton Remake™ has proven a fairly stable subgenre, but I digress.) Though its 40-plus year run makes Planet of the Apes quite a long-running series, its meager seven films (so far) is dwarfed by several other, far more durable film franchises. We’ve collected a few of our favorites after the jump; check ‘em out, and add in your own long-running favorites in the comments. Welcome to “Trailer Park,” our regular Friday feature where we collect the week’s new trailers all in one place and do a little “judging a book by its cover,” ranking them from worst to best and taking our best guess at what they may be hiding. This week, we’ve got ten new ones—taken as a group, a rather eclectic mix of styles and subjects indicating that the summer movie season is drawing to a close. Check ‘em all out after the jump. Your Flavorwire is always on the lookout for cool pop-culture related visual art, so we can't thank the good folks at Brain Pickings enough for drawing our attention to Israeli artist Noma Bar and his book Guess Who: The Many Faces of Noma Bar. This 2007 volume collects 50 of Bar's minimalist vector portraits of iconic figures from the world of film, science, literature, politics, music, and more. We've picked out ten of our favorites from the book; check 'em out after the jump.